Of all the social networking sites you can use on your Samsung Galaxy Note 3, Facebook is the king. It’s the online place to go to catch up with friends, send messages, express your thoughts, share pictures and videos, play games, and waste more time than you ever thought you had. 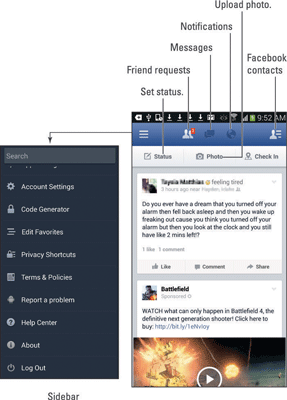 Your Galaxy Note most likely doesn’t come with the Facebook app. If so, great! If not, you can obtain the Facebook app for free from the Google Play Store. This app is your red carpet to the Facebook social networking kingdom. To get the Facebook app, go to the Google Play Store and search for the Facebook for Android app. Download that app. After you install the Facebook app, you may see the Facebook notification icon. Choose that icon and complete the steps required to complete the installation. The first time you behold the Facebook app, you’ll probably be asked to sign in. Do so: Type the e-mail address you used to sign up for Facebook, and then type your Facebook password. Touch the Log In button. If you’re asked to sync your contacts, do so. Some people recommend choosing the option to synchronize all your contacts, which adds all your Facebook friends to the Galaxy Note’s Contacts app, the phone’s address book. 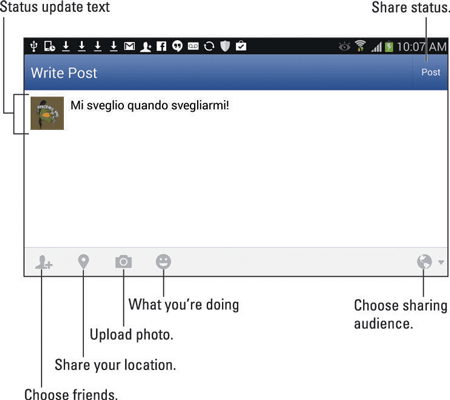 Touch the Sync button in the upper right corner of the screen to begin using Facebook. Eventually, you see the Facebook News Feed. When you need a respite from Facebook, press the Home button to return to the Home screen. The Facebook app continues to run until you either sign out or turn off the phone. It may also time-out after a period of inactivity. To sign out of Facebook, choose the Log Out command found at the bottom of the sidebar. Touch the Confirm button. Show the sidebar by touching the Facebook app icon. To hide the sidebar, touch that icon again. Use the Like, Comment, or Share buttons beneath a News Feed item to like, comment on, or share something. You can see other comments by choosing Comment item. To update the News Feed, swipe down on the screen. Notifications for Facebook appear atop the touchscreen. The primary thing you live for on Facebook, besides having more friends than anyone else, is to update your status. It’s the best way to share your thoughts with the universe — far cheaper than skywriting and far less offensive than a robocall. Touch the Status button at the top of the screen. If you don’t see it, ensure that you’re viewing the News Feed and swipe all the way up to the tippy-top of the feed. Type something pithy, newsworthy, or typical of the stuff you read in Facebook. When you can’t think of anything to post, take off your shoes, sit down, and take a picture of your feet against something else in the background. That seems to be really popular. You can also set your status by using the Facebook widget on the Home page, if it’s been installed: Touch the What’s on Your Mind text box, type your vital news tidbit, and touch the Share button.